Thanks to everyone for you support while I was deployed. I'm now back home and I am accepting orders again. If you send an order with the form below and do not hear back from my within a couple of hours to confirm your order, PLEASE use this email address to contact me and I will take care of your order that way as sometimes the web form sometimes doesn't work. Welcome to my survival bracelets webpage! Please read all the following before submitting the form. Thanks! I was the first one to make my bracelets the way you see shown above. 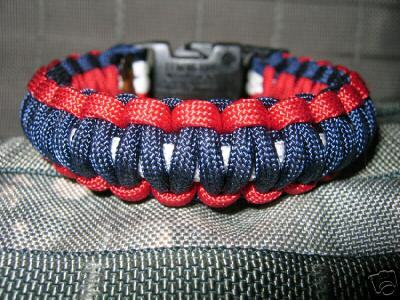 I did not invent the paracord bracelet -- I just invented the best way that it can be made. I am a soldier in the US Army. When you buy from me, the money goes towards buying upgraded military equipment that is not available through "official" channels. I also purchase batteries for weaponlights and medic supplies for training. I got an email from a "veteran" that was angry with me saying that folks should buy from those of us like myself that are CURRENTLY SERVING. Seems he wants to be able to use the money from HIS bracelets for beer and is angry with me taking away sales from him so that I can buy things like lightweight plate carriers. Did I mention that I have been diagnosed with lumbar spondylosis as a result of my military service? You know what caused it? Carrying 70+ pounds of body armor (front and back plate plus two side plates plus helmet) 1000 yards a day. That's what caused it. The lightweight plate carrier (if I had been able to afford one) would have reduced the weight I would've had to carry. This is just one example of the type of gear upgrades your purchase will help out with. This form is a special form for folks to order my bracelets at a discount for multiple bracelets. Please let me know how many you'd like, your paypal email address, the size for each, etc. I do not add your email address to any list whatsoever...it is only ever used to send the invoice for the bracelets. I hate spam and will never send you any emails after this. 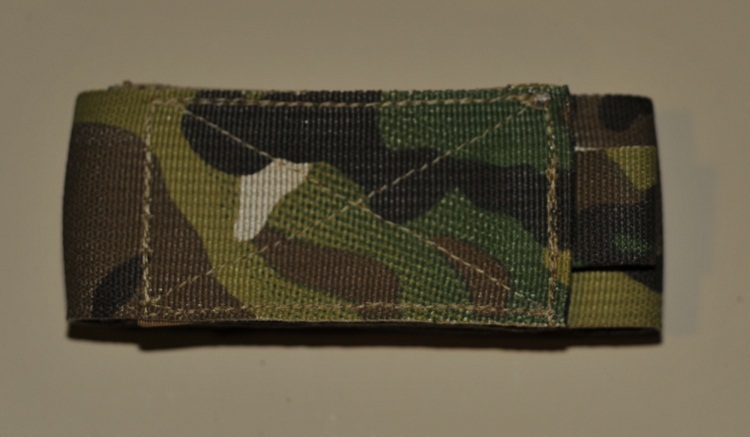 Regular size buckles are available in black, desert tan, or foliage green. 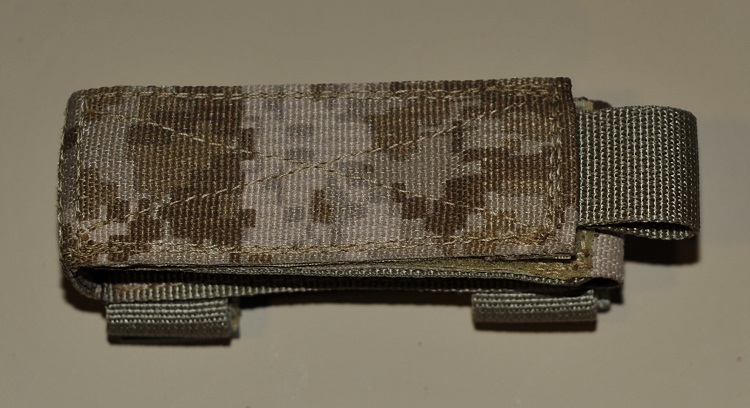 Smaller buckles are now also available in black, desert tan, or foliage green. IF YOU DO NOT FOLLOW THESE INSTRUCTIONS EXACTLY AND PRECISELY, IT ***WILL*** DELAY YOUR BRACELETS!!!!! The reason is because I will have to email you back and ask you to provide the information I need in the format I've asked for in step 3, below...please, please follow these instructions to the letter so that I can get your bracelets shipped as soon as possible. 1. Please take a SNUG (but *NOT* super tight) measurement of your wrist using a 1" wide strip of paper. The strip of paper should touch your wrist at all points, all the way around your wrist where you'd like to wear it with ABSOLUTELY NO GAPS AT ALL. Do NOT allow there to be ANY slack in this measurement at all or else your bracelets are going to be HUGE and I cannot resize them once they're finished. 2. Please add either 1.25 inches to that measurement for a nice, comfortable fit ***or*** 1.5 inches for a quite loose fit, like a lady's bangle bracelet. 3. When you send this info, it should look like this as an example...please use this EXACT wording (with your own measurement, of course): "Snug measurement was 7.5 inches. Please add 1.25 inches for a snug fit for a total of 8.75 inches." IMPORTANT!!! If your wrist measurement before adding anything is 6.5 inches or smaller, I have to use a smaller (black only) buckle that is slightly contoured in order for it to fit well and be comfortable for you. They are also made in the USA by ITW/Nexus. The only difference is I have to use gutted 550 cord for the core strands only so that it will all fit on the buckle. The bracelet can be one, two, or three colors. For reference, the bracelet at the top of this page has red edges, navy blue weave, and white core. When sending your color choices, please refer to them in that manner -- edges, weave, and core -- so that I will be sure I know what you'd like. If you call them "outside", "inside", "outer", "inner", "under", or anything else, it *will* delay your bracelet as I will have to clarify this with you. Same with the measurement instructions -- please send them exactly as I've requested so I can be 100% sure I get it right. $18 each for three or more bracelets. Shipping is $5 if your order includes bracelets, no matter how many you order. If your order is for keychains only, shipping is $3 no matter how many you order. 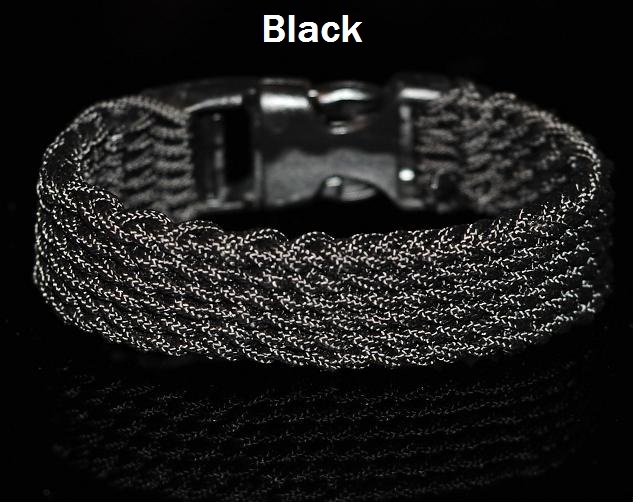 I am also offering a NEW style bracelet that looks like this: The advantage of this type of bracelet is 1) EXTREMELY RAPID DEPLOYMENT of the cord due to its unique construction method and 2) You'll have over 15 feet of cord (or more) in the average size bracelet. This is even more cord than in my regular bracelets, above. It is constructed of Type 1 (Type I) paracord which has a tensile strength of approximately 100 pounds. No "survival" bracelet is EVER intended for and should NEVER be used to support your or someone else's weight. That is not what they're for!!! You need a good Yates escape kit for that...not paracord. At 100 pounds strength, it will work perfectly for any other task, such as making a trap/snare, tying up a shelter or lean-to, making a bow to start a fire, etc. These bracelets take much, much longer to make (about 5-7 hours, depending on size), so cost $35 shipped. If you'd prefer this type of bracelet, just select "bracelet" in the form below and in the notes section, put "Type 1" and the color you'd like. 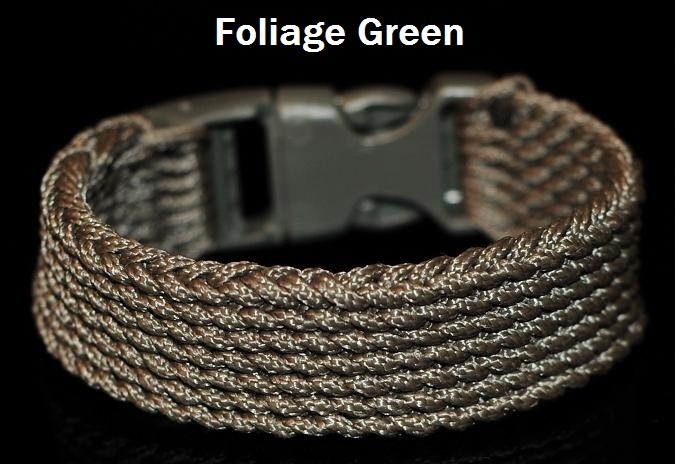 Right now, I have the following colors available for this bracelet: Multicam, ACU camouflage, camo green (very close to "foliage green" found in the ACU uniform (ARPAT) pattern) with black tracer thread, ranger green (similar to OD or Olive Drab green) with yellow tracer thread, khaki (close to coyote brown), and black. ALSO -- PLEASE do NOT email me asking where your order is, when it shipped, when it'll get there, etc., ok? When you do that, my having to reply to you takes time away from me being able to make your bracelets, pouches, cases, or someone else's if yours are already done. So, since this has been happening way too frequently lately, here's what I'm going to do from now on: If you email me about your order and it's not finished yet, I'm moving your entire order to the back of the line and will finish all the other orders I have before finishing yours. If you email me asking when your order shipped and it has already shipped, I may not reply to you at all. This is out of fairness to the others that actually have patience and don't send emails asking if their order has shipped. I am sorry, I just do not have the luxury of extraordinary, copious amounts of free time to answer your nagging, impatient emails all day, ok? In short, trust me...I will get your items made and shipped out as soon as humanly possible. I do work 40-60 hours per week like you probably do, so sometimes I only have a couple of hours a night to work on them. Rest assured, I will get them out as quickly as I can -- no amount of emailing me will make that happen any faster. All it will do in fact is slow your order down because I will put it at the back of the queue. 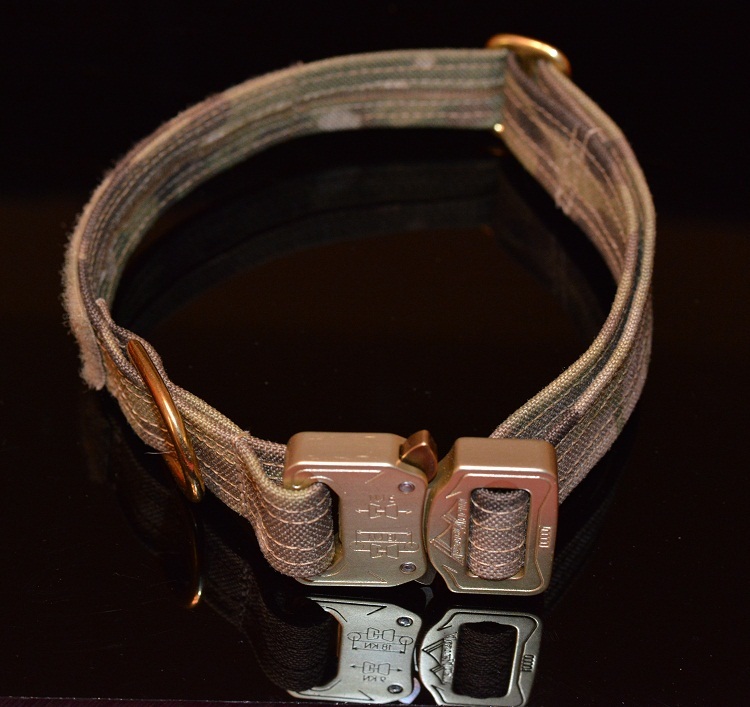 Tactical K9 Dog Collar (Perfect for military working dogs or police (drug/EOD/etc.) ($75 shipped within the USA): Yeah, it's expensive -- that is because just the Cobra buckle I use on it costs $40 by itself...but hey, if you're dog's not worth it then go buy some cheap-o collar from wal-mart or something, I guess. I've sold these to some coworkers that are MP's for their military working dogs and they love them. Your dog will NOT break this collar, but if you need to get him out of the collar in a hurry, this is the easiest collar to put on and remove that you will find anywhere. It is super strong and it CANNOT be released while under load. This is the best collar for military or police "tactical" working dogs available anywhere. The collar is adjustable and I include a patch of velcro for you to attach your dog's nametape, "rank", etc. I can make these in Multicam, ACU (UCP) Camouflage, black, and desert tan right now and I can get other colors if you have something else in mind. I can also sew the nametape directly to the collar if you'd rather do that than use the velcro. Multicam Knife Pouches ($28 shipped within the USA): These are similar to TADGEAR pouches except I make them in the USA!!! out of US-manufactured materials and I make them to order...you don't have to wait "years" for them to be in stock like you do with TADGear's stuff.